This 4-Post Adjustable Open Frame Rack is an ideal solution for mounting network and telecom equipment in a wide variety of applications from a small wiring closets to colocation datacenters. This rack is designed for standard 19in equipment, supports up to 1,000lbs, and features a 5/8in, 5/8in, 1/2in universal mounting hole pattern which are roll threaded for #12-24 hardware. The depth adjustments may be made in 1/2-inch increments allowing this rack to best fit each application. 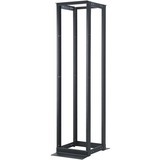 Constructed of 6061-T6 structural grade aluminum, top angles and patented reinforced base are standard and the rack features a self-supporting and self-squaring base along with standard 1/2in junction holes for securing multiple-rack lineups. This rack is listed to the UL 1863 Standard for Communication Circuit Accessories and it meets EIA-310 standards. It assembles quickly and easily and allows excellent cable management opportunities.